Offering one of the most sublime, ceaseless views of Walker Bay and backed by the Olifantsberg, La Gratitude presents the perfect base to discover and explore an incredible variety of activities in and around Hermanus. Watch whales breach from La Gratitude’s balcony, or walk along the Hermanus Cliff Path that begins in front of La Gratitude and follows the coast all the way into the village of Hermanus and beyond to Hermanus’ New Harbour. Head in the opposite direction and walk along kilometers of pristine beaches to the lagoon and beyond. There is paragliding off the Olifantberg, vineyard tours that include sampling of delectable South African wines, and shopping for art and crafts bargains in Market Square . Whatever your energy level, Hermanus offers it all in the sun and “champagne air”. We have selected a group of people for their expertise in a range of areas, who can arrange to share their knowledge, run classes or help you to arrange special functions at La Gratitude. Some of these people are listed below. If you have a particular interest not mentioned here, Contact us for our extensive list of experts. Frank Woodvine has lived in Hermanus for 30 years and has a wealth of knowledge on the local indigenous plants and animals. Hermanus has a variety of indigenous fynbos and a visit to La Gratitude without walking amongst it, is an opportunity missed. He can take walking parties to the local Fernkloof Nature Reserve, which is 10 minutes drive from La Gratitude or along the cliff path, which starts 100 meters from La Gratitude and meanders through beach coves and Melkbos around the bay to the Hermanus village. There is an abundance of bird life in the Overberg and we can arrange for a local bird guide to take you bird watching and share their first hand knowledge with you. You can also simply enjoy the multitude of bird life in the garden at La Gratitude. Les and Schalk of Lescha Tours are Licensed South African Tour Operators and Registered National Tour Guides who are passionate about South Africa. They will tailor make trips for you to the local Overberg Region or further afield within South Africa, to suit your needs. Grotto beach is a pristine Blue Flag beach that stretches for 12 kilometers – a perfect beach for long walks and flying kites. This is one of the most popular beaches among holiday makers because of the facilities available and because it is so vast that it is never overwhelmingly crowded – even in peak holiday season. Facilities at Grotto beach include: Dutchies restaurant, a play park, excellent ablution facilities, ample parking and barbeque facilities. 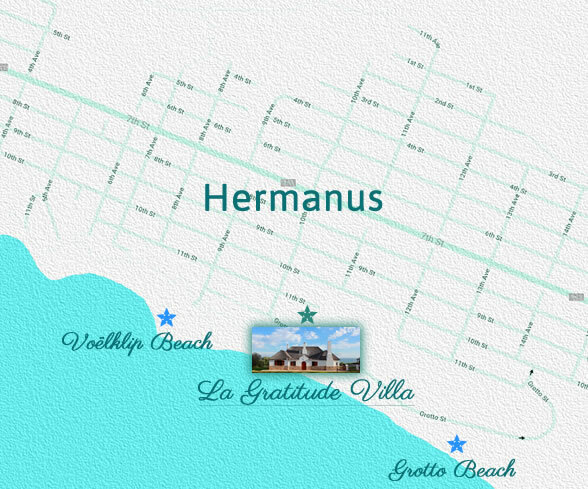 La Gratitude is situated a stones throw away from Grotto Beach. This is one of the original Hermanus holiday homes and the ideal spot for a self-catering family holiday in South Africa. Voëlklip is a small beach that also has excellent ablution facilities. It’s the beach to go to if you like being by the seaside but aren’t too crazy about sand because it has large stretches of lawn above the beach. Voëlkip beach is popular with surfers and sunbathers. This is, as the name suggests, a long beach in a secluded cove at the foot of the Hermanus cliffs. Langbaai is considered to be the ‘secret’ beach of Hermanus as it is tucked away and not well sign posted. There are quite a few steps to get onto the beach which can make things difficult for those with very small children, elderly people or anyone who has a penchant for taking loads of equipment to the beach. Kammabaai, also known as Nanny’s Beach, is a family favourite. This beach has excellent surfing, as well as wonderful rocks to climb and a few hidden coves and rock pools. Inexperienced surfers must check with locals about the tide. The current can be quite strong at times and there is a trick to getting out into the surf. There are picnic spots and barbeque sites under the Milkwoods and basic ablution facilities. The Sandbaai beach is a good beach for sunbathing and quick cooling dips. There are a lot of rocks so it isn’t really a beach to go to for swimming or surfing. Sandbaai beach is best for snorkeling, exploring and shell collecting. It is dotted with rock pools full of marine creatures and swimming is safe at low tide. There are changerooms and showers. This is also a favourite for families because of the safe swimming the lagoon provides. Onrus beach is popular with local body boarders and surfers. There are shower facilities, a little shop and an outstanding restaurant, The Milkwood, overlooks the beach and provides take-aways and light meals. This little beach in Vermont provides a perfect setting for picknicking. Flanked by high dunes, the beach is sheltered and a nice place for the sunbather and popular with sandboarders. Arts and crafts – numerous artist-owned art and craft studios and galleries. Beaches – La Gratitude is situated above, and looking out onto, Hermanus’ most famous beach, the blue flag Grotto Beach. As the coastline dotted with coves ends, so Grotto Beach begins, extending past the magnificent lagoon at the mouth of the Klein River all the way to De Kelders. Other nearby beaches include Voelklip, Kammabaai, and Langbaai. Bird watching – an ornithologists dream with mountain, coastal, river and estuarine avian habitats. De Wet’s Huis Photo Museum – offers a extraordinary photographic documentation of the history and development of Hermanus. Dolphins – are often seen in the region. Species include the endemic Heavisides dolphin, Bottlenose dolphin and Common dolphins. Extreme sports – hang-gliding, paragliding, mountain biking, powerboat racing. Fernkloof – in the saddle between Lemoenkop and Olifantsberg, Fernkloof Nature Reserve hosts one of the richest floral kingdoms in the world. It has 50 km of hiking trails and a mountain biking track and boasts the most stunning views of Hermanus. Festivals – the Hawston Sea Festival (December), the Hermanus Wine & Food Fair (July), the Hermanus Whale Festival (September). Fishing – with the sea and lagoons full of galjoen, steenbras, kob, red roman, silver fish, red stumpnose, John Brown, and many more, Hermanus attracts fishermen from all over the country. In addition, New Harbour is a working fishing harbour. Boating and rubber duck enthusiasts can make use of the facilities in the New Harbour at a fee. Fish shop – buy fresh fish, live crayfish, oysters and other quality seafood direct from the sea in the New Harbour. Hermanus Magnetic Observatory – is an active participant in the worldwide network of magnetic observatories, which monitor and model variations of the earth’s magnetic field. Visitors are allowed by appointment. Hiking – On the fynbos-covered mountains, Fernkloof Reserve offers unparalleled vistas on a variety of walks above the town. Pamper yourself – as a holiday destination, Hermanus boasts all manner of spas and beauty salons that offer the very latest treatments all aimed at ensuring you relax and de-stress. Passion Play is held in the Old Harbour every year. Perlemoen, abalone or Venus ear – Hermanus is regarded as the principal centre of the perlemoen industry in South Africa. Restaurants – Hermanus not only has its own daily supply of fresh fish, it is surrounded by the farms and vineyards of the fertile Overberg region. A direct consequence is the plethora of excellent restaurants that offer a delicious variety of local and international cuisine with stunning vistas. Rock lobster eating and fishing tours. Roridula gorgonias (vlieëbos in Afrikaans) the largest carnivorous plant in the world grows in the Fernkloof Nature Reserve. Shark-cage diving with the Great White Shark in the cold Atlantic. Shopping – charming boutiques, markets and shops. Sports – golf, tennis, squash, bowls, canoeing, yachting, diving and surfing. The Old Harbour – contains a small museum and is a historic highlight of the town, remaining unchanged from early days when it was the centre of activity in the fishing village. Walks – a stunning cliff path hugs the coast from one side of Hermanus to the other, affording spectacular views of sea and mountains. Water sports– windsurfing on the tranquil lagoon, or diving, fishing and boating in the sea. Whale Crier – Hermanus has the world’s only Whale Crier who sounds his kelp horn to announce where whales have been sighted. Whale watching – from July to November the Southern Right Whale may be seen breaching and playing in the sea, just off-shore. These sights have earned Hermanus the reputation of the best land-based whale watching in the world. The most frequently whales spotted in the Walker Bay area is the Southern Right Whale, but Humpbacks, Bryde’s and the occasional Killer Whale has also been spotted. The whales start arriving in May in order to calve and to mate in the shallow water. Peak time for whales at any one time is October, but many can still be seen in November, tailing off in December.